What makes one city different from another? Some of it is the geography, the economy, or the buildings. But a big chunk of it is culture. Every city has its own culture. A journalist recently interviewed me about Indianapolis and asked about some of the things that make that city’s culture distinct. I’m reposting ten of my observations here. Keep in mind that many of these points are relative, not absolute. They are comparisons versus what I see in other cities. 1. Indianapolis has a very open social structure. Many cities have very insular cultures that are difficult to penetrate. The Midwest river cities like Cincinnati, Louisville, and St. Louis are like this. If you weren’t born there, in a sense you’re always something of an outsider. I’ve also heard reports of similar things about Cleveland, where people who come there have trouble making new friends and connections. The stereotype of some Southern cities is that who your daddy was, etc. matters a lot. In Indy, outsiders can move to the city and rapidly make friends and contacts, and to get integrated into civic networks. Columbus, Ohio is similar I’m told. I speculate that these cities have a more open orientation because they are state capitals. They frequently have new players circulating in and out, and this opens up the social networks considerably. A newcomer is likely to have a much better time of it in Indianapolis than most other Midwest cities. 2. The social life of Indianapolis happens in back yards. This was an observation made some time ago by local cultural commentator David Hoppe. It’s dead on. In a city like New York or Chicago, there’s a palpable sense of bustling street life. This is largely absent in Indianapolis. If you operate on the assumption that this is the One True Way cities should function, Indy looks bad. But in reality the history and even built environment of Indy simply created different forms of social life. Different doesn’t mean worse. People in NYC have tiny apartments, so of course they want to be out and meet people out. People in Indy mostly have single family homes, and so people can gather inside and in back yards. This produces things like Sunday night dinners and porch parties. In my experience, this produces many more useful “collisions” than the merely physical ones you’re likely to have on the street in Chicago. 3. A bimodal distribution of quality. Indianapolis has a “barbell” shaped quality curve. There’s a lot of stuff that’s pretty bad, but some things that are truly excellent. So, for example, the design of the average street in Indianapolis is terrible, but Monument Circle is one of the world’s great urban spaces. This contrasts with say Columbus, Ohio, where the vast majority of things are solid but relatively few stand out as terrible or exceptional. Interestingly, Nassim Taleb recommends barbell strategies. This may be one reason why Indy has the best small city tech scene in the Midwest. 4. An excessive preference for the pragmatic. This is a common Midwest trait. Again, I’m writing a future magazine column about this and its downsides. But for now note that the Midwest tends to actively discourage ambitious undertakings and the pursuit of excellence. This can produce a stifling environment for people who want to dream big and care about doing things right. Indy is certainly far better than the rest of Indiana on this, but it’s still present. Looking at Indy’s barbell quality distribution, it’s clear the community gives itself permission to do A+ level work in certain areas: sports hosting, Monument Circle, etc. But I’ve yet to crack the code on what the characteristics of these are that made them acceptable while so many others were not. 5. A weak sense of neighborhood identity. Cities like Chicago and Cincinnati are deeply steeped in a sense of neighborhood. They have strongly delineated, long-standing neighborhood areas people strongly feel themselves to be part of. Like Detroit, Indy has always been more about what side of town you live on than what neighborhood you live in. There were some exceptions to this, but the norm has been a weak sense of neighborhood identity. Unigov, where the city took in a lot of suburban and rural areas in a city-county merger, doubtlessly contributed to this, but I suspect it far predates that. 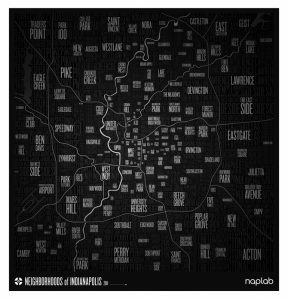 One reason some friends and I started the Naplab Indianapolis Neighborhood Map project was to start strengthening a sense of neighborhood identity. 6. Low cultural differentiation vs. the state. People who live in Indianapolis are Hoosiers and think of themselves that way. There’s historically been little sense of urban identity apart from the state. Chicago is like a different planet from Illinois. People in Chicago think of themselves as Chicagoans first, and Illinoisans secondarily if at all. By contrast, in Indy people are Hoosiers first, residents of the city second. It’s telling that there isn’t even a commonly used word to refer to residents of Indianapolis. Indianapolitans anyone? Also, the city is mostly a draw from the rest of the state, so it has a very Hoosier feel. In Chicago, there’s a Midwest feel because it draws from a regional catchment area. In Dallas, you meet people from everywhere. This is one the urban progressives would probably like to dispute, but they are a relatively small tribe in the city. 7. Low institutional differentiation vs. the state. As the only big city in the state, the city’s major institutions are frequently pressed into double duty as statewide ones. There’s an Indiana Historical Society but no Indianapolis Historical Society. (Is Indianapolis the biggest city in the country without its own historical society?) The major state economic development groups like TechPoint are basically Indianapolis organizations that serve a statewide audience. 8. A strong civic but weak political culture. 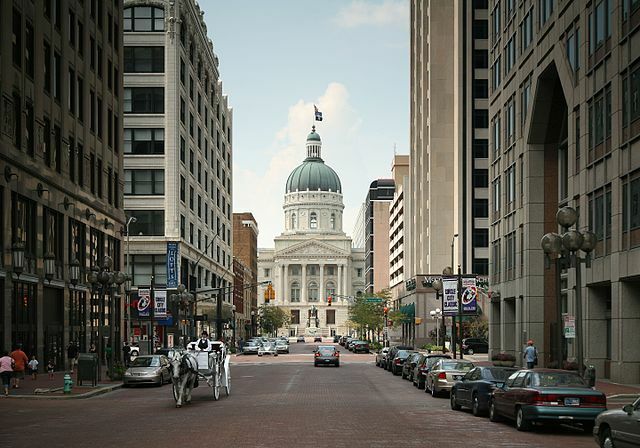 Indianapolis is known for having three top notch mayors in a row: Richard Lugar, Bill Hudnut, and Stephen Goldsmith. But in general mayoral leadership and city government have not been the drivers of change. I don’t know how Lugar operated as I was not around. Goldsmith seemed to have a strong mayoral agenda (e.g., outsourcing). But others relied more on a broader civic grouping of people – business, foundations, etc. to get things done. I suspect most cities would claim their civic sector is strong. Chicago likes to boast of its corporate involvement, for example. But it’s also clear that Chicago likes to get things done through a powerful mayor in City Hall. In Chicago, if the mayor says Yes to you, you are probably golden. In Indy, however, that’s not the case. It’s hard to describe how this works because frankly it’s very opaque. Civic initiatives are largely cooked up in the back room behind the scenes. There seems to be a big focus on consensus. Disputes are generally not aired in public. And there’s a very “go along to get along” civic ethic. This has had a lot of benefits. First, while it generally takes longer for Indy to decide to do something than other cities, once the decision is made to go forward, it almost always happens. You don’t see things like Louisville arguing for 40 years over whether and where to build a bridge (which only got built because Mitch Daniels stepped in). You don’t see repeated failures to pass a light rail program, like in Kansas City. When Indy decides to do something, it has a very high success rate. (A critic might say some of these things should have failed and that success at doing something you never should have done in the first place is a Pyrrhic victory). 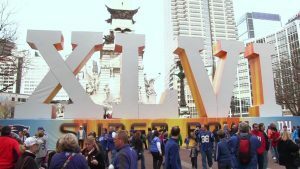 Indianapolis hosting the Super Bowl. Image via Shutterstock. Secondly, there is long term continuity in civic initiatives. Rarely do things die when mayors change. The sports hosting strategy has gone back over 30 years, for example. While the current mayor didn’t strongly support the transit initiative developed under his predecessor of a different party, he didn’t stand in its way either. Contrast with how a new mayor came into Cincinnati and tried to pull the plug on a streetcar project. Or at the state level Chris Christie in New Jersey taking office and cancelling a rail tunnel project. The downside is a very enfeebled and low capacity city bureaucracy. Also, some changes need to come from the political sector in order to have democratic legitimacy. This makes the Indianapolis system bad at solving certain kinds of civic challenges. It should be no surprise that the mayor-driven (i.e., politically driven) system of suburban Carmel, Indiana was better able to redesign infrastructure, for example. Another downside is that it’s an extremely difficult environment for a civic entrepreneur to try to get things done. That’s where cultural fit comes in. If you don’t know how to navigate an opaque civic structure, accumulate political capital in that environment, etc. then you are going to fail to accomplish anything. This tends to reward insiders vs. outsiders. Though because of point #1, outsiders can become insiders fairly easily in Indianapolis, if they know how to play the game. Due to the nature of the civic structure, playing the game is likely to involve significant dilution of their ideas and compromises many people might find unpalatable. 9. A strong preference for local hires. Indianapolis might be the biggest city in the country that’s basically never hired a global starchitect to design a major civic structure. Now there are many negative things one might say about the starchitect trend, but this is still revealing of the local culture. There’s a strong preference to hire locally in most places, but it’s very high in Indianapolis and often very clearly trumps quality. In fact, an out of towner with high flying ideas is exactly the kind of person who is going to be resented by a significant faction of the local power structure, and probably not be long for this world. 10. You need to a guide to find the good stuff. Similar to point #2, you’re not just going to stumble into some famous place randomly, like you can in many cities. It’s a city where you need a guide to point you at the good stuff. For example, PRINTtEXT at 52nd and College is one of the best magazine stores in the entire world. I’m not exaggerating. But you’d never find it unless you were looking for it. There are all sorts of great things and great people in Indy, but they take time to find and get to know. In some cities the greatness is on the surface. In Indy, it’s in layers you need to dig up over time. I think you could say that #8 is probably tied pretty strongly to Unigov as well. What is good for the core isn’t what they want in the suburban and rural area and vice versa. Trying to move things along with 25 councillors from widely diverse districts is very difficult. There’s very much a conservative culture here to bump up against from time to time, but overall, I would say that if one engages thoughtfully instead of approaching things with a bulldozer so-to-speak, Indy residents are hungry for and open to meaningful change. They know the city has some big financial problems with due to the very low density sprawled nature of Unigov, and so they know some things do in fact need to change. Aaron, this is spot on! I don’t know Indy as well as I used to, but you’ve accurately covered what I remember about it. One thing that unites points 4, 6, 8 and 9 about Indy is what I view as an absolute lack of pretentiousness for a major city. Most every large city makes some claim for being exceptional in some way; Indy makes no such claim at all. And I think #6 is why — low cultural differentiation with the rest of the state. Maybe being founded as a state capital reinforces this, but you really get a sense that Indy belongs to the whole state in a way that’s different from any other city I’ve been to. Case in point — in Chicago local TV news, if there’s a national news story with a Chicago connection, it will be brought up, no matter how tenuous. In Indy, if there’s a Hoosier connection to a story, you’ll see it, and that connection could be from Kokomo, Bloomington, Terre Haute or Richmond. I think Indy is very comfortable with being Indiana’s city, and fine with going only as far as the rest of the state will let it. Pete, you forgot “Racing Capital of the World”. That’s an old, big claim by Indy that was still very much a thing until the F1 US Grand Prix pulled out a decade ago. When the F1 race started here, and the NASCAR race was still in its heyday, we had the three biggest one-day sporting events in the world, each with attendance north of 100,000. And in a way, Indy does belong to the rest of the state, since the low level of “home rule” means the city can barely sneeze without getting permission from the State Legislature under Unigov. Chris, the “Racing Capitol of the Word” moniker was in place well before either the NASCAR or F1 race ever came to town. And it’s still very fitting, regardless of the current status of those two races. I really enjoyed this piece. I live in Southeast Indiana, a part of the state that gets ignored (unless we’re discussing riverboat taxes) by Indianapolis and our closer neighbor, Cincinnati. Being between the two I was really struck by #5. You can’t get folks from Cincinnati to shut up about what neighborhood they are from but in Indianapolis I had a hard time even knowing the names of the neighborhoods. Indianapolis also doesn’t get enough credit for the simplicity of its layout. The grid system is aided by the relatively flat topography but it makes it so easy to get around the city. (Methinks Aaron is homesick for Indy….). When I visited the city in 1996 I was quite impressed with its orderliness, attractive street design (a bit City Beautiful and Beaux Artes-ie) and stock of fine period architecture. Being a state capitol definitely gooses Indy’s economy and I detected an air of pride, as well as Republican business hustle. Great museum and sports venue, too. Dennis, If the last time you were in Indy was 1996 then it is far past time for a return visit. I moved here 11 years ago and the growth has been astounding. You would quite frankly not even recognize the city. And since Gen Con moved here in the early 2000s, a significant chunk of geek culture revolves around Indianapolis, too. (See my link further down the thread.) And Gen Con provides a great excuse to check it out again if you haven’t been here in a while! Good read. I agree with most of what was written. In regards to #5, I believe this to be changing. It probably started with the emergence of Mass Ave as a cultural and, now residential hub. Since then, it has spread to places like Fountain Square, Fletcher Place, Midtown, etc. I now identify as living in Meridian-Kessler when asked. Previously, it would be some vague answer about between Broad Ripple and Downtown. For #6, this will likely start to shift as more people move to Indy in search of IT jobs. This includes those from Indiana as well as out-of-state. Even those, like myself, who moved from another part of the state to Indy, there is already a loss of connection to the rest of the state. If the state legislature continues its culture wars, there will be either a strengthening of those who oppose this in Indy, or they’ll move out of state. The recent appearance of regional social networks like Nextdoor has helped with this, too. When I lived on the Old Northside, I was able to get in touch with my neighbors and even attend a meeting where old timers discussed how wild and wooly the area (now staid and stately) used to be. And now I live in historic Irvington, which also has its own local identity. In addition, OneAmerica Tower was designed by Skidmore, Owings, and Merrill (SOM) who many would consider a starchitect. There’s also the new Cummins Headquarters designed by Deborah Berke, who also might be considered a starchitect. Great insights, Aaron. As commenter Dennis Gale noted, Indianapolis did very well by City Beautiful…a remarkable accomplishment, since, at that time, Indianapolis was a lower-tier city than it is now…clearly overshadowed by cities now considered its peers (Milwaukee, Cincinnati, even Kansas City). Yet the physical form of City Beautiful left a stronger positive impression in Indy than cities three times its size. Compare to St. Louis, where it just created an abundance of unused green space (way more City Beautiful than the St. Louis could ever support), or Detroit, where it amounts to two blocks of institutions engaged in a face-off on yawningly wide Woodward Avenue, all subsumed by Wayne State Campus (not enough to catch the eye). The civic interventions in Indianapolis were appropriately scaled then and still seemed right-sized as the city has grown/sprawled. I have to argue that Columbus, OH and Kansas City (the two other Midwestern cities that depended heavily on annexation) actually have similarly poor design in many, many areas. They have tons of residential streets with no sidewalks, curbs or storm sewers–as does where I currently live in the Lehigh Valley PA. I think it’s more a product of city boundaries relating to time periods of construction than anything else. But I will grant this much: Columbus didn’t bisect its north side with an awful six-lane arterial like Indy’s 38th Street, and Kansas City still installs streetlights in the most low-density spaces (as practical). Speaking of guides to find the good stuff, I’ve written one–chiefly intended for people who come in from out of town to visit Gen Con or other geeky pursuits, so it mainly focuses on stuff close to the downtown area. I hope folks will find it worth reading. 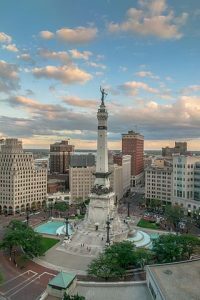 Indy similarities and differences with Columbus are revealing in contrast to the river towns of Cincinnati, St. Louis, and Louisville which are hopelessly hidebound and utterly dominated by their local elites who aggressive keep new people and ideas out. Cincinnatians, for example, actively seek to hide the city’s best so that they don’t have to share it with people they don’t know. With such an approach, Cincinnati can never create new economic growth internally. You can’t create the next starbucks if you actively reject customers who you don’t recognize as part of your established social class. Indy and Columbus offer examples of Midwestern success that contrast with the incestuous stagnation of the river towns but I’d argue that they are two quite distinct examples. Columbus is less provincial, more diverse, and more differentiated from Ohio than Indy is from Indiana. So, Columbus is more open to hiring non-locals and to innovation. Columbus’ neighborhoods are more defined and focus development in the city in ways that benefit metro Columbus’ in my view. The presence of OSU has no parallel in Indy, either. Does economic geography explain some of this? Is Indy too close to Chicago to hold onto the young and ambitious? Indianapolisites can literally drive to Chicago for a lunch-time job interview and be back home in time for dinner. You can’t do that if you’re in Columbus. Interesting observations. I definitely agree Columbus is more progressive and benefits a lot from OSU. But I don’t see it as particularly innovative. Quite the opposite in fact. They’ve basically been expert “cloners” of best practices from elsewhere. Does Indy offer a more promising, or fundamentally different, model of innovation in the Midwest than Columbus? Indy has a vastly stronger brand in the marketplace than Columbus does. That’s partially a result of its innovation, such as focusing early on sports and getting the Colts before the door closed on such endeavors. Indy’s tech startup scene is also much stronger than Columbus, despite the presence of Ohio State. Indy’s innovation is what has allowed it to overcome many of its structural weaknesses, such as its lack of a major brand name university. I’m completely unaware of Indy’s innovation. Do you have examples of what you’re referring to besides sports? Having lived in both Indianapolis and Columbus, I have to say that Columbus has much greater competition from Cleveland and Cincinnati than Indianapolis does from Chicago. If you are a person or a business who wants the quality of life afforded by a major city and want to live in Indiana, then there is one option for you. In Ohio, that is not the case, and I actually think Columbus has done a much better job of elevating itself over the last 20 years in that regard. If Fort Wayne and Evansville both had metro areas of a million people, I would be interested to see how Indianapolis might be different. As a graduate of both Ohio State and IUPUI, I also have to agree that Indianapolis has no equivalent to the kind of boost Columbus gets from OSU. Maybe because of that, Columbus also claims other institutional juggernauts like Battelle, while Indy can’t do the same. On the other hand, Columbus doesn’t have the industrial/commercial juggernauts that Indy has (Rolls Royce, Allison, Anthem, Lilly, Roche Diagnostics, Simon, Dow Agro, and the 2nd largest FedEx hub). Yes, it does have a huge back office for Chase…but it’s not the North American HQ or a major business unit of the company. Another difference: as pointed out above, Indy has a “yuge” charitable endowment (Lilly Endowment, which is worth $12 billion at the last annual report in 2015, and close to that today) whose local giving is very, very significant. I respectfully disagree. Columbus is home to Nationwide Insurance, AEP, L Brands, and Worthington Industries, plus Cardinal Health and Wendy’s in the metro area. The McConnell Foundation is also not quite as robust as Lilly, but it is still significant. I think any argument could be made for either city being stronger in any category by cherry-picking institutions, but this discussion has me seeing that the two cities are different in many other ways as well. I think it would be very interesting to have this discussion in the context of the two cities’ physical growth, with Indy being boxed in by Unigov and Columbus spreading like a snake into surrounding counties and using its municipal water system as a “join us or else” annexation tactic. What I was getting at: Rolls, Allison, Lilly, Dow Agro and Roche are all STEM based. They invent/innovate and make things, have thousands of highly-paid local employees, and have combined annual sales of tens of billions under their Indy-based operations. Their applied research and development impact is huge and a real regional advantage, especially across all realms of life sciences (plant, animal, human). I realize most people outside of Central Indiana have no idea of the impact of the Lilly Endowment. It is one of the US’ ten largest private charity/endowment funds, bigger than Mellon, Pew, MacArthur, Bloomberg, Kellogg, Rockefeller, Kresge, Duke, Carnegie. Only Gates, Ford, Getty, and RW Johnson are larger. Unlike the rest of those, the majority of its ~$500million in annual grants are directed to its home city and state. (~60% in 2015) Again, a real regional advantage. Columbus and Indy are almost identical in population and the size of their metro economies. It’s the composition of those populations and economies that is at issue here. I love this. So many things I’ve thought but haven’t laid out or found a way to explain. Thanks for writing this. One note is how people here identify as Hoosiers… which we do… but for example, I remember in HS seeing email forwards like “You might live in Indiana if…” and I couldn’t relate to a single one. It was all small town/rural stuff. I went to Ben Davis. Then someone wrote a “You might live in Indianapolis if…” and it was pretty much on the money. So we may be Hoosiers, but if you grow up in Indy, it might mean something a bit different than the rest of the state. But you’re right, we identify with what state we are in, much more than Chicagoans. I hadn’t heard of that magazine store. 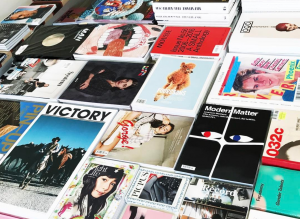 That’s good – I’m one of those artsy “urban progressives” and if I’m able to keep up with everything cool in this city, it means we need more cool stuff. Otherwise it becomes stale fast. I have good friends in NYC, Denver, DC, and other cities with more of a “cultural” reputation. (Well, maybe DC doesn’t.) I’m always trying to convince them to visit me here. “You’ll have a blast. You just need someone to guide you to the good stuff.” The few that have had a great time. And when I worked at Circle Centre Mall in my younger years, I met so many conventioneers and visitors who told me how surprised they were to enjoy Indy. Thinking more about No. 8, in many ways the city is an anachronism to the days when local corporate do-gooders (I don’t use this term negatively) pushed money back into their hometowns. The sports boom was largely fueled by money thrown off from the endowment associated with Eli Lilly & Co., which at one point had the richest endowment in the U.S. As I recall, there was a tax law change in the 1980s that required endowments to give much more money, which is why you see the Lilly name everywhere in Indianapolis (and even other parts of Indiana, notably at IU-Bloomington), and why Indianapolis suddenly had a lot of money to build, say, a natatorium and track stadium. Local businesses kicked in to invest in the construction of Circle Centre Mall downtown as a quasi-private-public partnership, and the return on their investment was then plowed into Bankers Life Fieldhouse, the Indiana Pacers’ arena. As I noted earlier, while Indianapolis’ mayor objected to the state passing RFRA, it was the business community’s objections that seized the day and led the legislation being watered down to the point that Indianapolis isn’t losing events like Charlotte is. In this sense, the Columbus that Indianapolis is most like is the one in Indiana, the one where Irwin Miller bankrolled the startichets that have made that city a modern architecture masterpiece. The business largesse is still have a big impact — the Cultural Trail is a public-private partnership funded in large part by community foundations, and particularly the Glick family, which made their money in apartment rentals. Unfortunately, this model is limited in that it can’t be replicated for work like, say, beefing up the local transit system. But Indianapolis has had a lot of success with these public-private partnerships, and they get things done. What does Salesforce do in Indy? That’s really a branch plant of a California company, isn’t it? Indy’s homegrown tech investment is in line with other Midwest metros. I’m unclear about how to understand ‘tech’ and ‘innovation’ within these numbers. SalesForce bought an Indianapolis born-and-bred company, ExactTarget, for $2.5 billion in 2013, which was the city’s first billion-dollar tech deal. The city had another billion-dollar deal recently with Don Brown’s Interactive Intelligence sold to Genesys for $1.5 billion. These are pretty small potatoes by Silicon Valley standards, but it’s a sign the city is able to develop tech talent and companies, even in the absence of a strong venture capital presence. As I mentioned, much of the tech is focused on online marketing and sales tools. I don’t want to overstate that Indianapolis is someday going to be Silicon Hoosier, but to Aaron’s point, it’s establishing a beachhead. Thanks for that explanation, Robert. I guess when I’m speaking of “innovation” I’m really thinking of ‘venture capital.’ I’m thinking of the creation of genuinely new products, services, or businesses. I think of big tech companies placing back office/branch plant operations in cheaper locations as something completely different. I may be making a distinction there that isn’t so important, but it was my assumption. Cincy, Indy, and Columbus are all roughly equal with respect to venture capital. That may be not the best way to look at innovation, though. Exact Target (now Salesforce) was the early innovator in targeted email marketing. That was innovation. Yes. Now someone in California controls that innovation. That’s always going to be an issue for any city on the margins of innovation, not just Indy. It seems to me that Indy offers a more informal and private sector-led model of innovation while Columbus seems invested in OSU and established multinationals sucking up the attention of those with money and power in Columbus. Together, they provide a useful comparison to understand the realistic possibilities for other Midwest metros. Drug discovery, animal health, and crop yield enhancements (Lilly and Dow) are evolutionary change machines, not necessarily disruptive, but still significant innovation harnessing basic research. Lilly and Dow are contributing substantially to Indy’s economy, no doubt. But, they aren’t ever going to be forces that will fundamentally bend Indy’s rate of growth upward. They are established businesses operating in established markets with established products and services. If Midwest metros are going to really change their economic trajectories, they’ll need to ‘leapfrog’ into new things. I don’t know if Indy, Columbus, or anywhere in the Midwest is really showing us how to do that yet. Even though Lilly’s best-known product was a household name (and made the company, Endowment, and city rich in the 90s…many people who didn’t work there were investors in Lilly stock), no one has heard the name Prozac since it went off patent in 2001. Also, Lilly put its ag chemical assets into what was originally a JV with Dow, Dow-Elanco. Dow bought out Lilly’s share but kept and expanded the unit here. It will be one of the “global innovation centers” of the new Dow DuPont agricultural spinoff even thought the corporate HQ will be in Wilmington. Pharma and ag are anything but “established products” fields…they rely on constant innovation and new product development. They have already bent Indy’s growth upward by growing high wage STEM jobs at a time when everything else in town was shrinking. Without them, Indy would have looked like any other Rust Belt city with the loss of tens of thousands of high-wage manufacturing, engineering, and administrative jobs at RCA, Mallory, Chrysler, Ford, GM, Western Electric, Jenn-Air, Harvester/Navistar, Carrier/Bryant, FMC, and other companies from 1975-2000. And Exact Target’s early funding was largely local. This means that the $2.5 billion buyout by Salesforce, along with a lot of talent, is re-circulating locally and is building the tech scene. Interesting debate. I’ll weigh in on Columbus as usual, since I live there. First, I’ve said it before, I think Indy had done a great job of leveraging its potential. Much better than Columbus. When I got here almost 20 years ago, I saw a city they had great potential but was basically run by a few big wigs. It played small ball, depending on annexation and generic population/ job/ land growth as its future. – Columbus beat out everyone else for the”Smart City challenge competition the DOT held mostly because of the”Columbus Way” where the whole community came together quickly to organize a winning strategy. This includes San Francisco, which probably would have been the odds on favorite to win an “improve transportation with tech” competition. Who knows if it will lead to anything, but the coordination itself shows progress. – Drive Capital. This may be the biggest thing to happen in the Columbus tech scene, and the entire Midwest tech scene, ever. Basically a few Silicon Valley venture capitalists set up shop here in town. They are actually investing in companies and many of them are moving to Columbus instead of Silicon Valley, and the others are staying in the Midwest. Now there will never be another silicon Valley, but having a regional hub of tech financing is huge. – Columbus seems to be finding its tech groove in health care and big data. It’s still behind Indy, but starting to come on. We just had our first $1billion buyout, and there seem to be at least 1 or two more in the next few years. True to Columbus, these are b2b companies that won’t be household names but will drive growth. – Columbus is actually a strong innovator in one area – fashion and retail. We have the third highest concentration of fashion designers in the US behind NY and LA. Why? Because of Les Wexner. He innovated specialty retailing here in the 60s. More recently he built Easton Town Center, the most influential shopping center in the past 25 years. It made the lifestyle center mall format the latest trend, although many urbanites may hate it. That’s just a few examples. Sure it remains to be seen if Columbus can break out in a big way, and I have been overly optimistic in the past ok how long it would take. But I am finally seeing some real progress, not so much in metrics as in the mindset and maturity of the city. I think Columbus had finally grown up and is ready to take a seat at the big boy table, even though the rest of the family might not realize it yet. You might want to reference David H. Fischer’ history of the origins of America’s four major regional cultures in order to view Indianapolis (and Columbus, Ohio) as a city of the Lower North. Stretched along US 40 and Interstate 70, the Lower North has deep roots in English Quaker culture and lies between the much larger Upper North and Upper South. Fischer analyzes various folkways including dialect and the very significant definition of liberty in each region. Our dialect, of course, includes dropping syllables out of words and dropping g’s as we zip through sentences. Our version of reciprocal liberty stresses that whatever freedoms one enjoys must be given to others. The book, Albion’s Seed, is a lot of fun and I found that Fischer’s description of Lower North culture to be an accurate described of the folkways of Jay County where I grew up.